It feels so good to save money. I’ve become increasingly frugal over the past year since purchasing a home. Every penny counts and I want to maximize my savings in every way possible. One of the biggest ways to save money is through coupons and deals. I do a lot of online shopping and when I see the little promo code or coupon code box on the checkout page, I often wonder if there is a coupon code that I could be using to save money. If you’ve ever tried googling to find coupon codes, you’ll understand my frustration. Most times, they are expired or aren’t even close to what you are looking for. 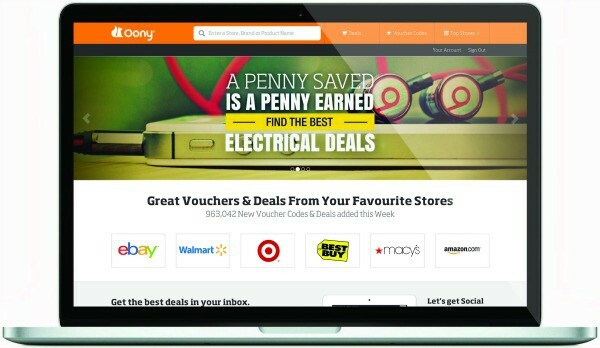 Today, I want to introduce my USA readers to Oony, a coupon and deals site designed to help you spend less on products from your favourite stores and brands through coupons, deals and special offers. Instead of googling, visit Oony first and save yourself the hassle! Oony is just relaunching in the USA and the amount of coupons and deals listed is growing daily. This week alone, they’ve added 34,921 coupon codes and deals in a variety of categories including groceries, clothing, electronics, travel and more. Oony is already a big deal in Britain with their British site saving the people of UK money on their online shopping. They also have a site in Brazil and India. I’m hoping that they’ll one day expand to Canada too! Using Oony is very straightforward. If you know what you are looking for whether its a brand, store or product, use the handy search feature at the top of the site. You’ll then be shown if there is any deals or coupons available for you to use. You can also search by popular stores, categories and see the latest submissions featured on the home page. Take a peek at the Deals page where you can find the hottest deals on popular brands and products. I like that they show that the deal was verified and when. Search for clothing, technology, home and garden and also by store to find the latest deals. The tools you need to save money are online so why not use them? Oony can help you save money on your purchases and help you become an even savvier shopper! JC PENNY has a Columbia 3 RIvers’s jacket for $39. I like the 15% off Kohls code! 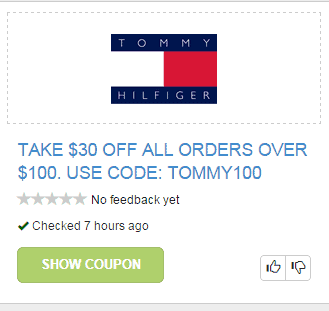 I like the 30% off Tommy Hilfiger clearance items coupon. I like 15% off at Kohls sounds great! The Nordstrom deal on Philosophy Blackberry Musk. 15% off your Kohl’s order. I like the Take an Extra 15% off your order when you use your Kohl’s Charge card! I like the target buy one toy get the second from the same brand for 50% off. Favorite deal is the Philosophy Sparkling White Ginger Duo for $12 at Macy’s. they have really good prices for camera’s. Thinking I could use a new one and coupon’s would really help. Vitacost and JC Penney discount coupons are my top 2 favorites! I could use the 15% off deal from Kohl’s. Sounds great!